You are here: HomenextPlacesnextMansfield WoodhousenextBridge Repairs! Another interesting photo from the Museums Chad Negative Collection, taken in 1983. Under the bridge a few yards on the left was a small general shop. The gent who ran it was a Mr Reg Scrimshire. Reg was a very friendly chap who would sell you almost anything including three, yes three, Park Drive cigarettes if required. He would put them in a little white paper bag for you, no problem. Mr S., was a blind man but new exactly where every item was in his shop. Clever and organised person!. Drop a coin in his shop and he would tell you the denomination by the sound of the coin hitting the floor. Often nipped over for a few items when working across the road at Landers garage. Late ’50’s / early ’60’s. Brian! The Jug and Glass wasn’t demolished, a new front was added, you can see the original roof. Having been brought up on LLS the pub has always been there and changed hands many times. Can remember being sent down to then the “Off Sales ” to obtain beer to be put in a large bottle, the landlord then used to put a sticker across the top maybe at that time it was some sort of law. If only our parents and other families who lived on the Lane could see how things have changed, some things not for the better and yet it’s progress they say Brian. Nice to hear from someone who lived on the Lane also. 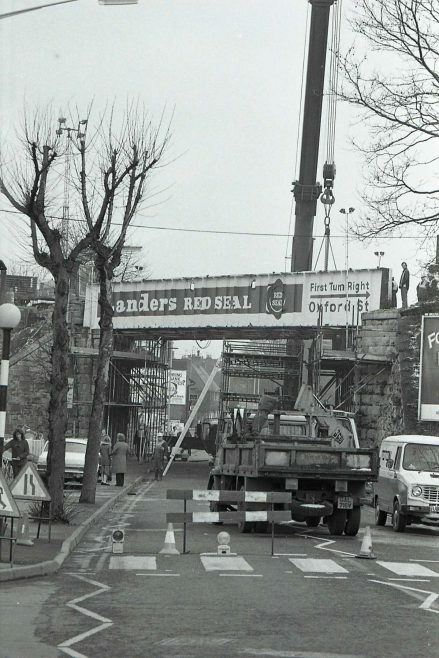 Landers bridge that was, the other side being the Black Bull pub. Although this bridge has fared much better over the years than it’s counterpart on Debdale Lane, which has been struck by high vehicles more times than a little, usually skip lorries and foreign artics. The tailbacks they cause are when it happens are considerable. The bridge was painted both sides at one time, however British Transport advertising increased the cost to three thousand pound a year each side, [could have been five it’s along time ago] and the bakery painters would not be allowed to paint it you had to use there painters so Jim Gascoigne decided just one side. Not so much bridge ‘repair’ but bridge ‘replacement’!